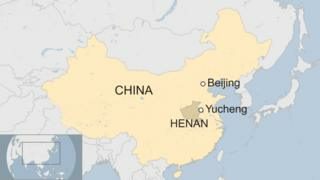 Two children have been killed and 20 other people injured after a bouncy castle was blown high into the sky in central China's Henan province. A small whirlwind known as a dust devil tore the inflatable from the ground at a fairground in Yucheng county. One parent reportedly told local media that she saw children fall from a height of about 20 metres (66ft). A county government official told the South China Morning Post it was unclear whether "human factors" played a role. Local authorities said 18 other children and two adults were taken to hospital. One child was in a serious condition while the rest were being treated for minor injuries. The dust storm hit the fair at about 15:00 local time (07:00 GMT) on Sunday. Footage shared on social media shows people running and stalls collapsing as the dust devil rips through the fairground, lifting the bouncy castle high into the sky. The names of those killed and injured have not yet been released. There are reports the police have detained the bouncy castle's owner. Dust devils are vertical whirlwinds that usually form in dry and sunny conditions. While they are rarely dangerous, they can grow to more than 10 metres wide and hundreds of metres high.